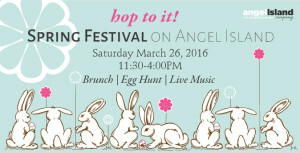 Hop On-Board Saturday, March 26, 2016 for Angel Island’s Spring Festival! Thank you for your interest in Angel Island’s Spring Festival. As of 9 a.m. PST on March 9, 2016 this event is no longer available for booking. Angel Island – Tiburon Ferry and Captain Maggie McDonogh invite you to be a part of Angel Island State Park’s NEW Spring Festival celebration taking place on Saturday, March 26, 2016 from 11:30 a.m. – 4:00 pm. Enjoy live music sponsored by The Lagunitas Brewing Company, a delicious brunch prepared by The Angel Island Café, egg hunts for children ages 5-11, and activities including face painting, balloon art …and of course a visit with the Springtime Bunny! Portion of proceeds will be donated to Ceres Community Project Marin. 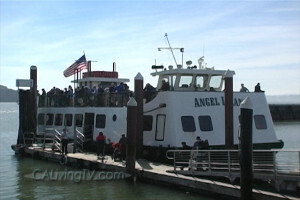 Hop on Angel Island Ferry in Tiburon, California for day-trips to Angel Island State Park. Egg Hunt with prizes in the eggs! *A limited number of Premium Package tickets are available. Angel island, angel island easter event, angel island egg hunt, Angel Island events, Angel Island Ferry, Angel Island State Park, Angel Island Tiburon Ferry, bay area easter weekend, Captain Maggie, Easter brunch 2016, easter weekend activities, family activities bay area, Tiburon, Tiburon Ferry Schedule.